Many Realtors have made their own website for their business. If the website was done well, it really helps their business. There is no secret formula, but knowing how to start is the first and often hardest challenge. There are many different reasons Realtors build their own website. For example they don’t know they can buy a website, they enjoy making their own website, but most important they know it is critical for their business. Any Realtor can make their own website. I won’t sugar coat it, because it can be hard if you don’t know what you are doing. The difficulty in websites can be thought of in two different ways: how to do it logistically, and how to do it technically. This article will cover how to logistically build a website. Those logistics include how to start, what services to use, and the process for getting everything to work together. Full disclosure: the term “bundled website service” isn’t really an official term. I actually made it up so I have a way to refer to Wix, Squarespace, Joomla, and many other “bundled” services. My definition of bundled website service is that for one monthly price, the user gets a domain name, website hosting, website themes, and the content management system (CMS) necessary to make a website. Bundled website services are relatively inexpensive. They can range from $0 to $30 per month. The drawback is that they are limited in functionality, utility, and built in SEO. For example, one of the limitations of Wix is that Wix does not support IDX integration (as of this article’s original publish date of June 30, 2016). So if you are interested in a bundled website service, just research them thoroughly so that you are aware of the benefits and the limitations. We won’t discuss how to make a website with these services, because we don’t have significant experience with them due to their limitations. But some very successful Realtors use them for their ease of making a website. WordPress is a CMS that runs approximately 25% of all websites in the world. It is open source, so developers build tools that integrate seamlessly and provide any functionality you can think of. The Agent Sidekick website runs on WordPress. WordPress is solid. Unlike a bundled website service, WordPress requires signing up for website hosting. And just like Squarespace, Realtors who use WordPress also need to sign up for IDX. With WordPress, you can make your own website with IDX for an initial cost of under $200, then a monthly cost of less than $55 per month. Brainstorm a domain name, and write down your top 3 to 4 choices on a piece of paper. Your domain name is the website address that is between the “www.” and the “.com” on a website like this: www.yourdomainname.com. As an example, the domain name of Agent Sidekick is www.REAgentSidekick.com. Although you have probably seen domain names that end in .net, .realtor, .co, and a few other options, we recommend sticking with .com. Don’t type the domain names that you like into the address bar on your internet browser just yet. There are companies out there that may purchase the domain name if it is available once they see someone is searching for it. These companies make money by offering to sell it to you for a lot of money later. If the reasoning doesn’t make sense, then just take our word on it, and write 3-4 of your primary choices on a piece of paper for now. Bluehost is a website hosting company. A “host” is basically where the website will live. When people view your website, they are pulling the information from Bluehost servers. When you build and edit your website, the edits are saved on the Bluehost servers. Hosting and one domain name through Bluehost is available for a starting offer of only $3.49/month for the first year. You can sign up for a Bluehost account here. After your first year, the domain name renewal is $16 per year. As you sign up with Bluehost, make sure you have your list of preferred domain names handy. When prompted to choose a domain name, first enter your top choice. Bluehost will tell you if that domain name is available or if it is already taken by someone else. If your top choice is taken, then go with your second choice, and so on. Our first choice of domain name was www.AgentSidekick.com, which unfortunately was already taken. So our backup www.REAgentSidekick.com was available, and we are happy to use it as our domain name. From your Bluehost account, you will be able to install WordPress for free. Bluehost makes it easy to get you on your way to building your website. A theme is kind of like a template for a website. In the olden days (pre-2005), everything you would see on a website was created by scratch by someone who wrote lines and lines of code in HTML. Those days are gone thanks to themes. HTML is still used by many people when making websites, but most of the heavy lifting has been done with themes. There are some themes that were developed specifically for Realtors. Many are free, and the better ones cost money. Since there are so many themes, there are websites that review them. We suggest a Google search to learn about free website themes, if you are interested in doing some additional research. However, we recommend using Elegant Themes, and their Developer package. Ok, it’s $89/year, but you will be very happy that you are using it. Elegant Themes has a visual editor included with their Developer package called Divi Builder, which makes building a website more intuitive. Additionally, the Developer package gives you have access to all 87 of their themes for free. We suggest either the Elegant Estates theme, which is real estate focused, or the Divi theme, which provides more flexibility in design. You can purchase the Elegant Themes Developer package here. Internet Data Exchange, or IDX, is required for your website visitors to search the MLS on your website. If your broker’s website includes an MLS search, then they use an IDX service. Like most tools, there is a wide range in pricing for the different IDX services. Just be aware that the less expensive IDX services have limitations that can include less MLS coverage, more cumbersome implementation and configuration as you build your website, less design flexibility, limited use and functionality for the end user, no SEO benefits, and much more. We recommend the iHomefinder Optima Power Agent plugin, which costs $49.95/month plus a $99 setup fee. There are IDX services that are slightly less expensive than iHomefinder, but you get a lot more value for just a little bit more money each month. You can sign up for iHomefinder Optima Power Agent here. As a comparison, using Squarespace, the upfront cost would be $99 for IDX, plus $65.95/month ($16 for Squarespace plus $49.95 for IDX). Other bundled website services may not include the option to integrate IDX, or have other limitations. 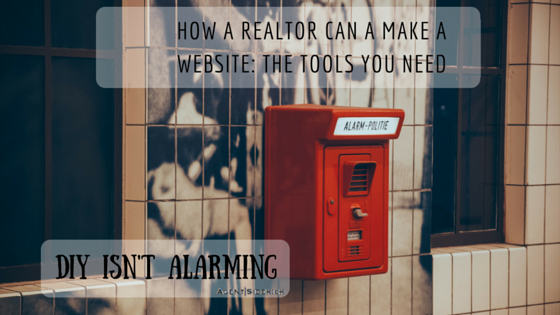 Realtors are business owners, and every business needs a website. With the many options available for websites, from buying one to making one, most real estate agents don’t know where to start. Building a website is possible, and the tools that we suggest will make building your website easy and the end product will be powerful. We recommend Realtor’s use a WordPress website, with Bluehost hosting, Elegant Themes for a theme (template), and IDX through iHomefinder. This combination is cost effective, and provides significant benefit over bundled website services. It may not be worth it to use a bundled website service in order to save a few dollars each month. Those services are great for coffee shops, food bloggers, and student groups. But real estate agents operate businesses with different needs than food bloggers, so they need to use the tools built for their business. These tools to make a WordPress website are less expensive than most services that can build a website for you, including Agent Sidekick. The value that Agent Sidekick provides is that we build the website for you, we setup all the services, we optimize for SEO, we assist with branding, we maintain it for you each month to ensure it is secure and has the necessary technology updates, and so much more. In addition, we also use a premium hosting package (more expensive than Bluehost, but Bluehost is really good) and we include a new email address for you at [email protected] Please see our pricing page to learn more. Building your own website can be fun, and obviously less expensive than purchasing one. If you are considering building your own website, feel free to contact us with any questions. Also, you can click on the links for each service in this article to take your straight to each service provider. Or if you would like Agent Sidekick to build your Realtor website, we would be happy to help! Contact us here to talk. We uncomplicate Realtor websites. We uncomplicate Realtor branding. We uncomplicate Realtor lead generation. And we uncomplicate Realtor marketing. You can contact us and drop us a note so we can tell you how.